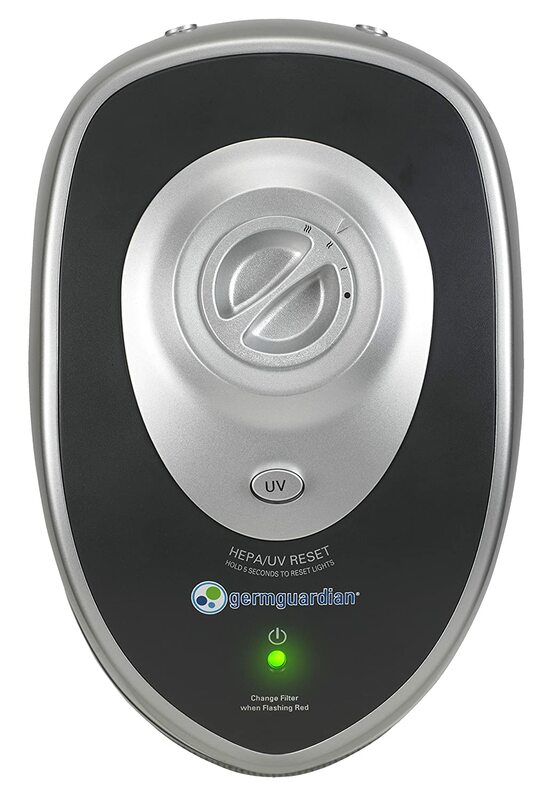 GermGuardian AC5000 has now been superseded by the GermGuardian AC5250PT for the same classic design but with latest GermGuardian’s technology. Let’s recall the original shape of the modern GermGuardian AC5300B, because whatever inside these two air purifiers are mostly the same. Together with us, we will check GermGuardian AC5000 Review – one air purifier remains the classic design language from Guardian Technologies brand. Guardian Technologies is the brand with insanely short air purifier refresh cycle with so many devices years after years. With little to no difference, it is really difficult for us – the customer to choose from the variety of options for a GermGuardian air purifier. We will do everything to give you a true GermGuardian AC5000 Review to identify this air purifiers among many nearly-the-same-performance devices of this brand. As the first one in GermGuardian’s 28-inch family, clearly GermGuardian AC5000 will hold the lowest cost. Within a same performance, you can purchase this air purifier as an alternative to a $10 more GermGuardian AC5300B, for the price tag of $119. The price is exactly the same with GermGuardian AC4300BPTCA – a smaller 22-inch device. There is a feeling of familiarity about the GermGuardian AC5000. Not to mention a whole bunch of air purifiers that share the same design with this air purifier, this style makes me feel like the classic PureGuardian AP2200CA and PureGuardian AP2800CA, which also belong to the Guardian Technologies. Another nice addition, especially on something many would consider a ‘budget’ device, this air purifier is now using the latest air filter from the manufacturer, which increases its value more. For $10 more than the Levoit LV-H132, you are able to deal with bacteria and viruses with the UV-C light in this air purifier. But, don’t rush to buy it. You can find a 20% deal off to this air purifier if you follow our link below. GermGuardian AC5000E 28-Inch Tower Air Purifier with with HEPA Filter, UVC Sanitizer and Odor Reduction. A 20% deal OFF for limited time to any new owners of this classic GermGuardian air purifier. As the first design for GermGuardian Tower air purifiers family, GermGuardian AC5000 has the same concept with the previous PureGuardian of Guardian Technologies company. That being said, you will have a 28-inch tower with a huge air output grill from the front and an also big intake grill from the back. With the classic air flow from back to front (which hasn’t changed since the first air purifier of this brand), this design can easily maximize the power of GermGuardian AC5000’s fan. There’s not much at the top of this air purifier, with only one UV-light button, one on/off button, one fan speed switch and a LED filter replacement indicator. GermGuardian AC5000 weighs only 10.5 lbs – the same weight with other 28-inch tower air purifier in GermGuardian family. To decide the power of an air purifier, basically we will look at how many filters it has and what types of air filters are used. With a 3-in-1 air cleaning system, GermGuardian AC5000 is able to defend against any types of allergens and bacteria. Pre-filter – A common GermGuardian pre-filter with Activated Carbon Filter to remove the large particles of pollutants and reduce odors created from smoke, cooking, and pets. 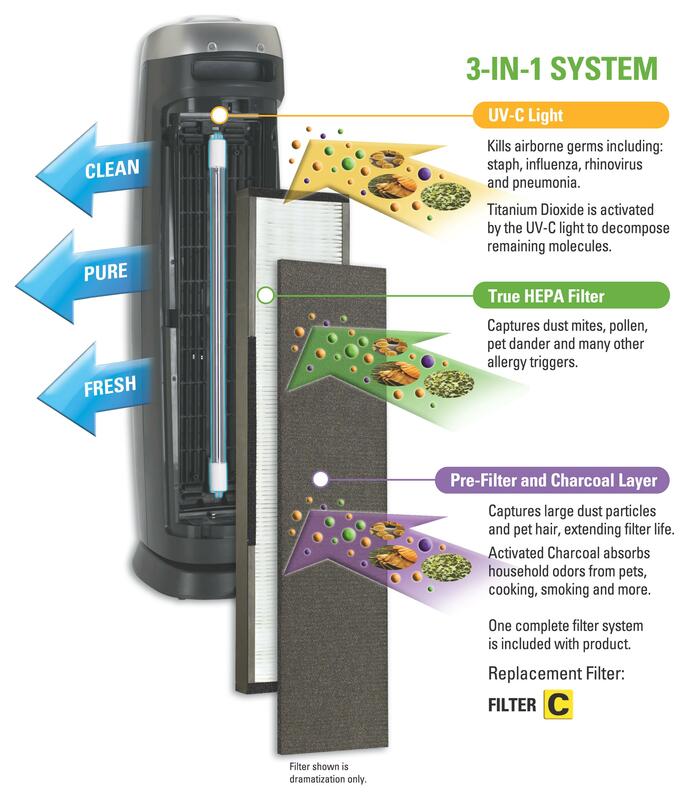 True HEPA filter – GermGuardian AC5000 uses a True HEPA Filter to capture 99.97% of microscopic allergens, dust and mold spores down to 0.3 microns in size. Installing a same set of filter as GermGuardian AC5300B, the fact that this air purifier is $10 cheaper will make it easy to sell to practical people. After testing all of the GermGuardian air purifiers, we can assure that GermGuardian AC5000’s performance rating is not inferior to its brothers. With an addition of an UV-C light bulb, the 3-in-1 air cleaning system from GermGuardian is one of the best technologies to deal with the tiny particles of contaminants. That is, like the AC5300B, GermGuardian AC5000 has the same efficiency of 99.9% for trapping any particles as small as 0.3 microns. The test conditions are 100 sq ft room and duration of 1 hour. This efficiency is even higher than the Honeywell HFD280B (with 90%), which is $10 more when buying. Remember that you can use the same filter in an AC5000 like AC5250PT, AC5300B or even CDAP5500BCA. That means you don’t need to pay an extra of $70 to use the best air filter of Guardian Technologies. It should also be noted that today Guardian Technologies has two layers of True HEPA filter for different purpose. The last but not least, you need to change the air filter every 6-8 months base on 24/7 use. GermGuardian AC5000 stays the low-medium room coverage of 180 sq ft. The ACH of GermGuardian AC5000 is 4X. The rating of air changes per hour is similar in all tower air purifiers of this brand. The CADR of GermGuardian AC5000 is 123 Dust/ 116 Smoke/ 128 pollen (cfm). This air purifier’s CADR rating is a little bit higher than the $200 CDAP5500BCA of Guardian Technologies. With this CADR rating and high ACH, we can rest assured that GermGuardian AC5000E is effective in cleaning a room area of 180 sq ft.
As the classic version of AC5300B, GermGuardian AC5000 is running with 3 fan speeds. Despite of the advertisement of ultra quiet at lowest setting, we can’t avoid the noticeable sound when using GermGuardian AC5000 at full fan speed. Even on lowest speed, the GermGuardian AC5000 produces a noise level of 40 db, and it is higher than most of the normal air purifiers in the market. For example, the AeraMax 300 is only 35 db, the SilverOnyx can be as low as 25 db, or Winix 5300-2 with only 28 db. Just like any other tower devices in GermGuardian’s family, GermGuardian AC5000 is not a perfect option for quiet places, such as your office or bedroom. Using the old 8W UV-C bulb, GermGuardian AC5000 consumes as much energy as the GermGuardian CDAP5500BCA. We recorded the power consumption of 70W, which is really high for a low fan speed air purifier like GermGuardian AC5000. For using a GermGuardian AC5000 8 hours per day, it would cost you up to $25 per year. Still, this GermGuardian AC5000 is an Energy Star air purifier, that means you don’t need to worry about the energy cost to run this air purifier. As the classic air purifier of this brand, GermGuardian AC5000 has nothing but a LED indicator for filter replacement. But what could you expect from this old device of Guardian Technologies in 2018? Remember that even the modern-design version of AC5000 – the AC5300B also doesn’t have any other additional features. If you are looking for smart features, you need to aim for the the CDAP5500BCA. This GermGuardian AC5000 is a decent air purifier in low-range market. With a built-in 3-in-1 air cleaning system, this air purifier can do a lot for a 180 sq ft. But running without any additional features back up, it is still difficult choice to go all-in for this air purifier. Should I buy GermGuardian AC5000? No, a GermGuardian AC4825 is exactly the same performance with $20 less. If you really like the 28-inch height of the GermGuardian AC5000, you should aim for the GermGuardian AC5250PT instead. If you have serious allergies or asthma to airborne pollutants: the GermGuardian AC5000 is great with the combination of True HEPA filter and UV-C light filter. If you want a better performance, or better fan power to clean your room faster: you must pay $80 more to choose between the AeraMax 300, Blue Pure 211, Honeywell 50250 and Honeywell HPA300 for a better fan power. If you need an air purifier with a better room coverage: you can choose the Winix 5300-2, Winix C535 and Winix 5500-2, as they can clean better than this GermGuardian AC5000. If you need a budget version of this air purifier: you should opt in for the GermGuardian AC4825, or search for the GermGuardian AP2200CA or GermGuardian AP2800CA. If you care about the annual filter cost and energy cost: the Hamilton Beach 04384 and Honeywell HHT270W are much better. If you love the additional features: you can get the AeraMax 100 or AeraMax 200 for the Smart Sensor. Another budget champ from GermGuardian brand. And the fact that it offers the same power as the AC5300B at less than $10 makes it a purchase I can fully recommend.